In a bid to woo its land-locked southern neighbour, China today offered $135 million in aid to Nepal to beef up its infrastructure and security during a brief and surprise visit by the Chinese Premier Wen Jiabao. The US will appoint an ambassador to Burma for the first time since 1990, US Secretary of State Hillary Rodham Clinton said on Friday. Clinton said the US and Burma will soon begin a lengthy process of exchanging ambassadors, which would hinge on the pace of reform in Burma. A man has been arrested in connection with the twin murder of Indian-origin Avtar Singh Kolar and his English wife in Birmingham, the West Midlands police today said. A bomb tore through a procession of Shia pilgrims heading toward a largely Sunni town in southern Iraq today, killing at least 53 persons in the latest sign of a power struggle between rival Muslim sects that has escalated since the American military withdrawal. In a Hollywood-style heist, a group of thieves prepared for months and dug a 100-feet tunnel to reach an ATM only to get away with £6,000 due to limited funds in the machine. In order to lay their hands on extra cash, the thieves put in elaborate planning and work in digging a 100-feet tunnel under a building to reach a cash machine. The labour-intensive robbery saw the gang spend six months digging a passageway under a Blockbuster Video in Fallowfield, Manchester to get underneath the cash machine, the Daily Mail reported. Eight persons, including four militants and one policeman, were killed when a group of heavily armed Taliban fighters stormed a district police chief's office in northwest Pakistan today, triggering a two-hour standoff with security forces. 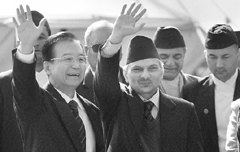 Holding hectic parleys with Nepalese counterpart Baburam Bhattarai, the country’s President Ram Baran Yadav, Maoist chief Prachanda and leaders of other parties, Wen inked as many as eight agreements amid a virtual media blackout. His trip was conducted in complete secrecy and under heavy security lockdown with police and paramilitary forces deployed in strengths in and around the capital. The security forces had as a precautionary measure detained large number of Tibetan refugees apparently to bar them from holding demonstration. “The visit has proven a milestone in the development of friendly ties between the two neighbouring countries,” Deputy Prime Minister and Foreign Minister Narayan Kaji Shrestha told reporters. The delegation level talks headed by Bhattarai and Wen were held in a cordial atmosphere and the two sides agreed to strengthen bilateral relations, expanding economic cooperation, he said. Under a series of agreements, Beijing agreed to provide massive assistance for a number of Nepal’s infrastructure projects and also bankroll the modernisation of the country’s police. China offered a 750 million RMB ($113 mn) in aid to Nepal during the visit by Wen. Wen announced $20 million as one-time special grant to Nepal. He also pledged to provide an annual grant assistance of 200 million RMB to Nepal this year as part of 750 million RMB worth three years grant assistance under economic and technical cooperation, according to Shrestha. China has also pledged to provide 4 million RMB to strengthen the Armed Police Force of Nepal and 10 million RMB to Nepal Police for enhancing its capacity. The agreements include among other things, relating to Management of Dry Ports along Nepal-China border, MoU on strengthening cooperation between the Ministries of Foreign Affairs of the two countries, agreement on economic and technical cooperation between the two governments. The agreements also include, exchange on notes between the two countries on building Armed Police Force college, agreement relating to providing police equipment to the Ministry of Home and MoU on operationalisation of loan mechanism between the two governments and Exim Bank of China. China is one of the biggest investors in Nepal, financing highways, power projects and other development projects. Wen is the first high-ranking Chinese leader to visit Nepal in a decade after a visit by then premier Zhu Rongji in 2001. During the talk, the two sides also clarified their policies governing the bilateral relations and expressed views that both the countries have common stand in many regional and international issues, Shrestha said. During the bilateral meeting, Premier Bhattarai briefed the Wen about the current political situation of Nepal and progress made in the ongoing peace process and the constitution drafting process, he said. Prime Minister Bhattarai told Wen that Nepal government is moving forward in concluding the peace process and constitution drafting by forging cooperation and collaboration, Shrestha said. US President Barack Obama’s administration has pursued a dual-prong policy of engagement and sanctions with the Burmese government. In recent months, Burmese President Thein Sein has taken steps to help his country out of isolation by the West. On Friday, scores of prisoners of conscience were released and on Thursday, the government signed a ceased fire with ethnic minority Karen rebels, who have been fighting for autonomy since Burma became independent in 1948. Both these steps were key US conditions for an improvement in its relationship with Burma. But, Obama and Clinton both said the Burmese government needs to release all political prisoners. Human rights groups and activists in Burma estimate that there are around 2,100 prisoners of conscience in the country. The government says the number is much lower. Around 220 political prisoners were released in October. Clinton urged the Burmese government to “unconditionally release all political prisoners, halt hostilities in ethnic areas and seek a true political settlement.” “There is more work to be done,” she said. She also called on the government to cut all illicit military ties with North Korea. Some countries, including India, China and Thailand, have engaged the government in Burma with an eye on the country’s vast natural resources. Since Thein Sein took office last March he has taken a number of steps to improve relations with the West. In a surprise decision in September, he suspended construction of a Chinese-operated hydropower dam in Kachin state, a significant development that angered China, a key ally of the Burmese military. Clinton visited Burma in December where she met Thein Sein, a former general, as well as Aung San Suu Kyi, the leader of the opposition National League for Democracy who was released in November after spending 15 of the past 20 years in prison or under house arrest. Since then Thein Sein’s government has announced elections on April 1. It has said Suu Kyi and her party can participate in the elections. The NLD won the election in 1990, the last election it was allowed to take part in, by a landslide but the military prevented it from ruling. Officers working as part of Operation Tiler executed a warrant at a house in Birmingham last night, and arrested a 24-year-old man as part of their investigation. He has been taken to a police station in the West Midlands where he is being questioned on suspicion of murder. The police launched the major investigation on Wednesday after the bodies of Carole and Avtar Kolar were found inside their home by their son Jason Kolar, who is a serving officer with the West Midlands Police. Fears of more bloodshed have risen in recent weeks, with the US no longer enjoying the leverage it once had to encourage the two sides to work together to rein in extremists. Most of the latest attacks appear to be aimed at Iraq's majority Shias, suggesting Sunni insurgents seeking to undermine the Shia-dominated government are to blame. Today's blast happened on the last of the 40 days of Arbaeen, when hundreds of thousands of Shia pilgrims travel to the Iraqi city of Karbala and other holy sites. The end of Arbaeen is one of the most sacred times for Shias, and public processions to commemorate it were banned under Saddam Hussein. The blast occurred near the town of Zubair as pilgrims marched from the nearby port city of Basra toward the Imam Ali shrine on the outskirts of the town, said Ayad al-Emarah, a spokesman for the governor of Basra province. In a Hollywood-style heist, a group of thieves prepared for months and dug a 100-feet tunnel to reach an ATM only to get away with £6,000 due to limited funds in the machine. In order to lay their hands on extra cash, the thieves put in elaborate planning and work in digging a 100-feet tunnel under a building to reach a cash machine. The labour-intensive robbery saw the gang spend six months digging a passageway under a Blockbuster Video in Fallowfield, Manchester to get underneath the cash machine, the Daily Mail reported. Amazingly, the group managed to get into the cash machine after completing the tunnel, which they had started four years ago in a previous botched raid. The thieves originally dug around 60-feet of tunnel in August 2007, but their secret raid was discovered by builders laying cables. Not to be deterred, the criminals returned to the passageway and finally got to the cash but after all their toil only got away with around £6,000. The thieves dug the tunnel from a railway embankment at the rear of the shop, which then went under a car park and beneath the foundations of the store. The passageway was around 100-feet in length and around 4-feet tall. It had also been fitted with lighting and roof supports. The tunnel was dug directly underneath the cash machine, where the offenders then used machinery to cut through more than 15 inches of concrete to steal money from the ATM. Three attackers detonated their suicide vests inside the police compound at Dera Ismail Khan while one more was shot dead by security forces, Khyber-Pakhtunkhwa police chief Akbar Hoti said. A policeman and three civilians who were inside the police compound died during the attack and subsequent exchange of fire between the militants and security forces. Seven policemen and two passersby were injured, officials said.